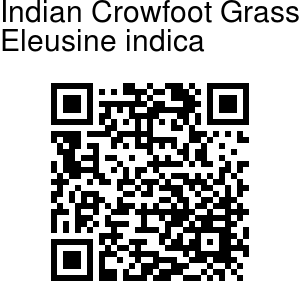 Indian Crowfoot Grass is an annual tufted grass. The plant is clump- forming, branching from the base, culms are 40-95 cm tall. Leaf blades are flat or sometimes folded, 15-30 cm long, 4-6 cm wide. 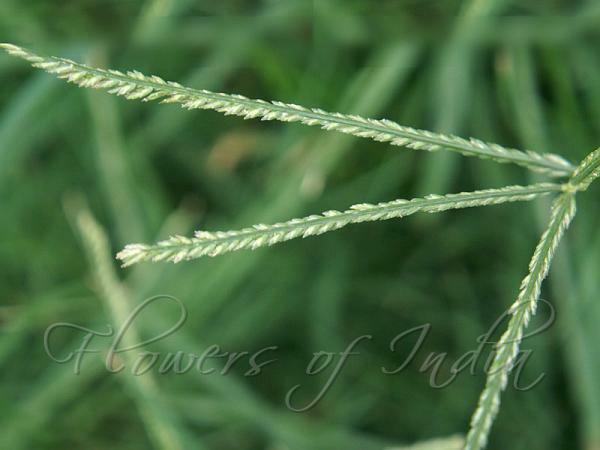 Flower spikes are mostly 2-6, usually 5 (4 digitate and 1 arising slightly below the tip of the stalk), 4-10 cm long. Spikelets are 4.5-5.5 mm long, the florets closely imbricated, dark green, disarticulating at maturity, leaving glumes overlapping in 2 rows on one side of the flattened rachis.